I’m always looking to make breakfast easy, quick and delicious! I love overnight oats and have been thoroughly enjoying my pumpkin pie combo. It’s perfect for this time of year and packed with all kinds of yummy goodness in the mix. It’s so simple…while I’m making dinner and something’s baking or simmering, I stir this together and pop it in the fridge. In the AM when everything is c-r-a-z-y, we simply grab and go. There you go folks…life made easy. But, don’t you just love the jar…it makes it look homemade, which it is, and like it took hours to make, but it didn’t! Cheers to October when it’s that time of year that should be pumpkin, spice and everything nice…. 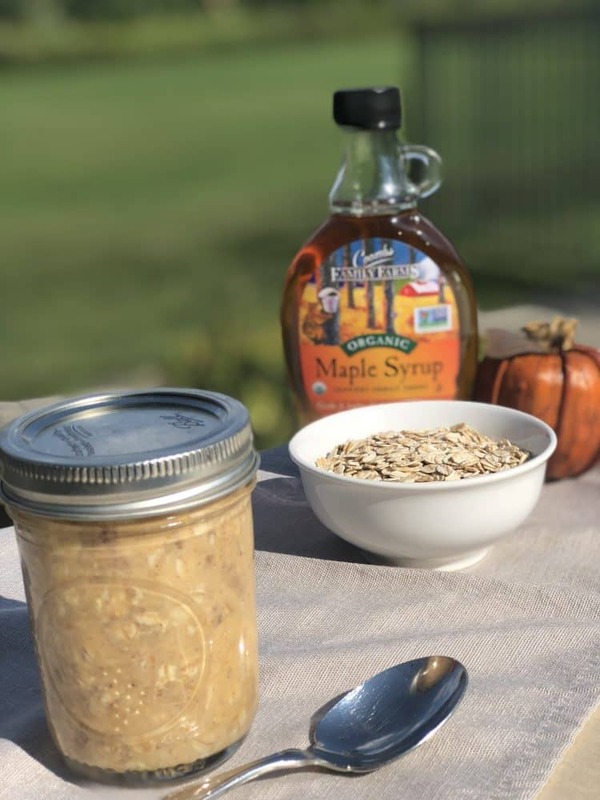 Stir the vanilla yogurt, rolled oats pumpkin puree, maple syrup, vanilla extract, cinnamon and all spice together in a bowl. Mix the ingredients well. Pour the mixture into a bell jar or other storage container. Refrigerate overnight and grab it in the morning for a pre-prepped breakfast. Looking for Dairy Free? Try the coconut, almond or soy yogurt alternatives. Where is the 100% Pumpkin Puree at my Price Chopper/Market 32 Supermarket? You can find options in the baking aisle. Looking for more delicious fall recipes? Check out my Apple Pie Parfaits that are super YUM for lunchbox packing fun. Or, try my Apple Cashew Smoothie. Or, tool around my site and search for anything ‘apple’ or anything ‘pumpkin’. Oh my – that sounds so yummy; almost like having dessert for breakfast! Yes, but filled with awesome goodness. Thank you for stopping by = appreciated! Great idea! I love overnight oats and there’s always a little pumpkin left over from other baking recipes! The maple syrup really adds to the flavor of this awesome recipe! Thanks so much for sharing your post with us at Full Plate Thursday, we have really enjoyed it. Hope you have a great day and come back soon!